Growing vegetables in containers? Learn about the best and most Productive Vegetables to Grow in Pots to have the bountiful harvest this growing season. 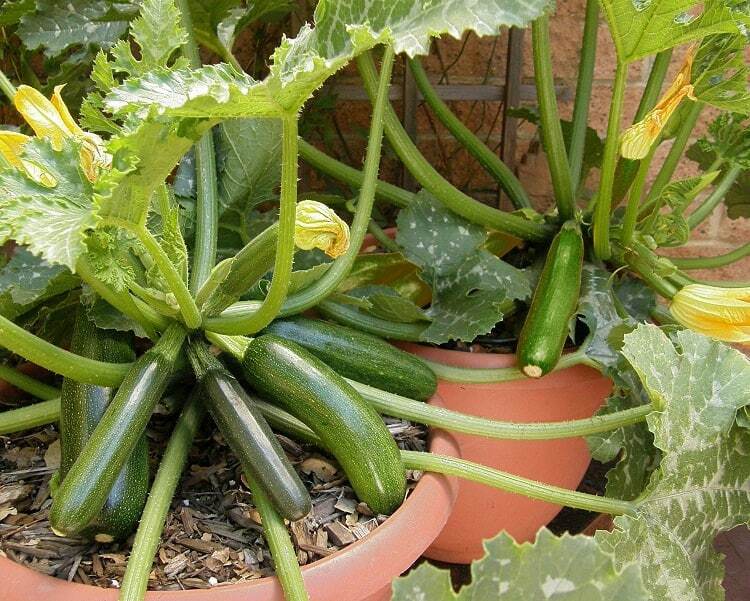 Growing vegetables in containers is possible, but there are some that grow easily and produce heavily in containers. For your help, we’re adding 20 Best and Most Productive Vegetables to Grow in Pots. A Tip: The productivity of a small garden also improves when you utilize vertical space. Using a trellis to provide support to trailing plants and vines always helps. Without a doubt, tomatoes are the most productive vegetables you can grow in pots. Tomatoes need ample sun (five to six hours minimum). The pot size depends on the type of tomatoes you are growing. In containers, growing dwarf varieties of determinate type is better. You should also try cherry tomatoes for higher yield. Click here to learn about the best tomato varieties for containers. Most of the beans are climbers or bushier type, and they grow upward. They are productive in pots and easy to grow. 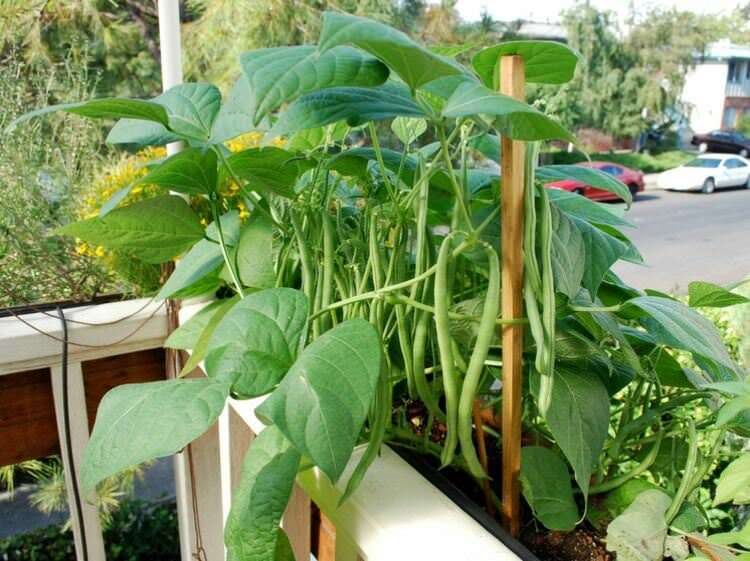 You can grow them on a trellis near a wall, and within weeks, you will get a green wall of beans running across the trellis. 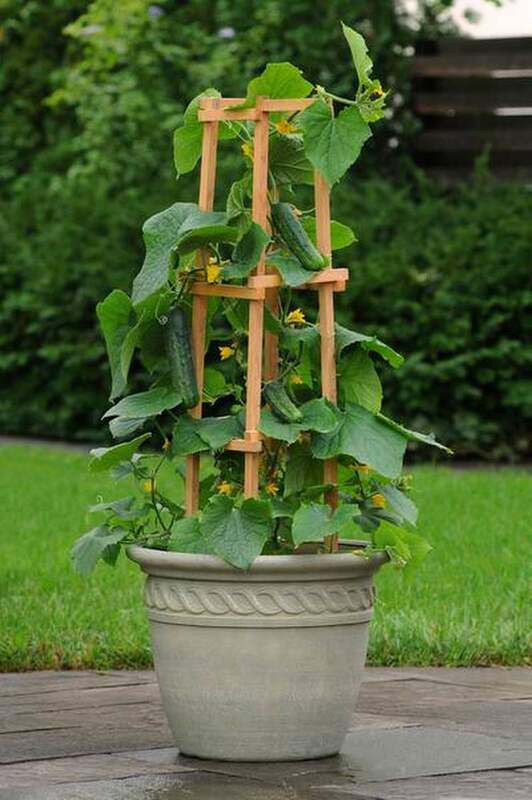 For growing beans, you need a sunny spot, and a pot that is minimum 12 inches deep (the bigger, the better) and a strong trellis-like structure for support. Since beans fix the nitrogen most of the vegetables that require more nitrogen are good to grow underneath them. If you’re growing beans in a very large pot, combine summer savory, kale, or celery with them. Lettuce grows up quickly, and you will have the opportunity to harvest this leafy green multiple times throughout the growing season. As lettuce is a cool season crop, you’ll have to decide what is the right time for its growth according to your climate. Usually, seeds are started in spring. But if you live in a warm climate, grow lettuce in winter. 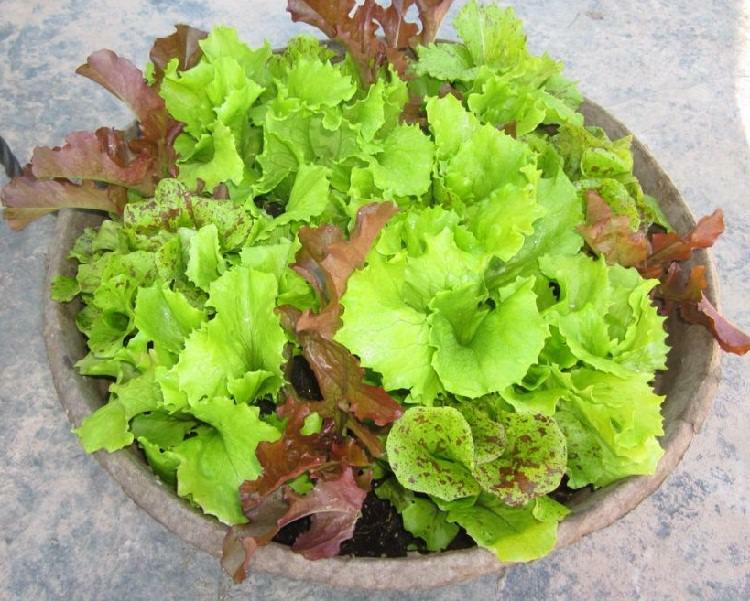 For growing lettuce, choose a wide planter rather than deep (six inches deep is fine). When planting, make sure to leave space of at least four inches between each plant. Remember, leaf lettuces can be grown more closely than head lettuces. Use well draining soil and do shallow and frequent watering to keep the soil slightly moist always. Must check out our lettuce growing guide to learn more. 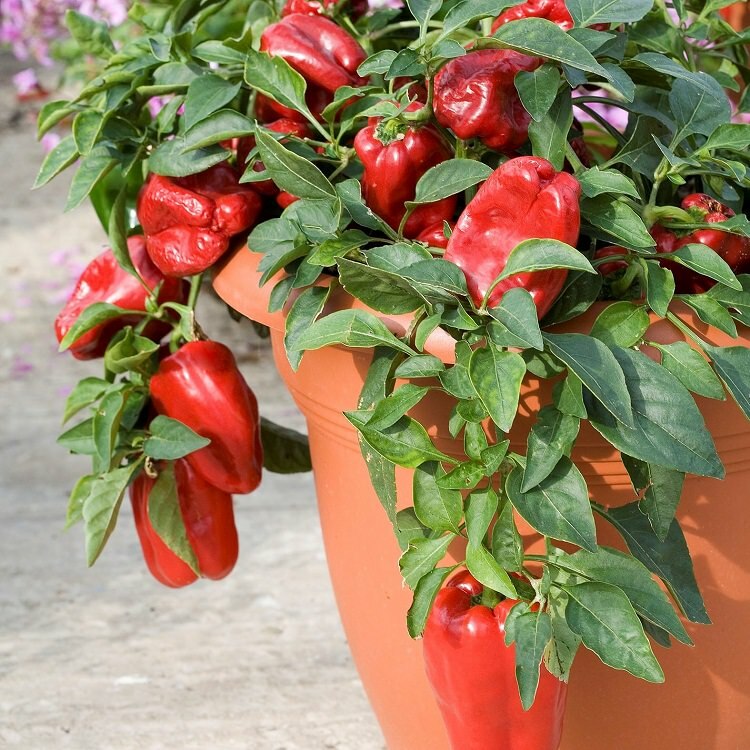 Peppers and chilies are super productive and excellent candidates for growing in containers. They look great in pots and need a sunny and warm place to thrive. If you keep the pot in a sunny spot and provide right soil and fertilize the plant time to time, it will fruit heavily. A large pot that is at least 12 inches deep is optimum. 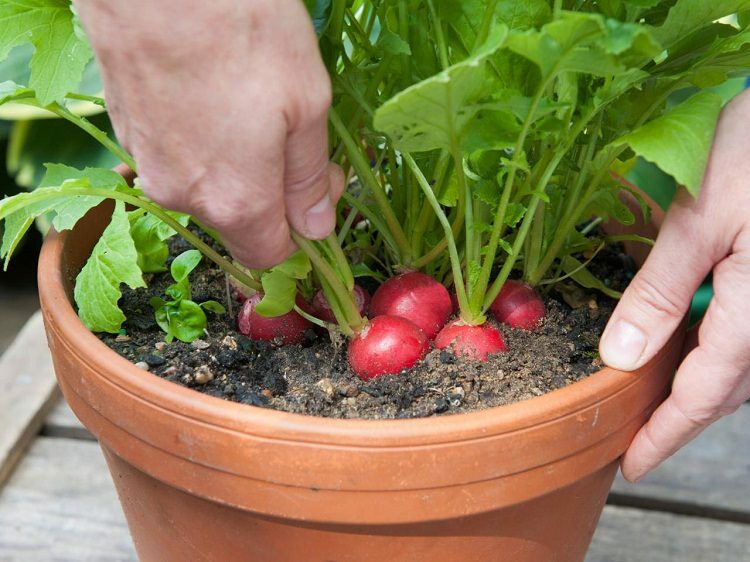 Radishes are one of the quickest growing vegetables and suitable for container vegetable gardening as you can also grow them in small and wide pots. 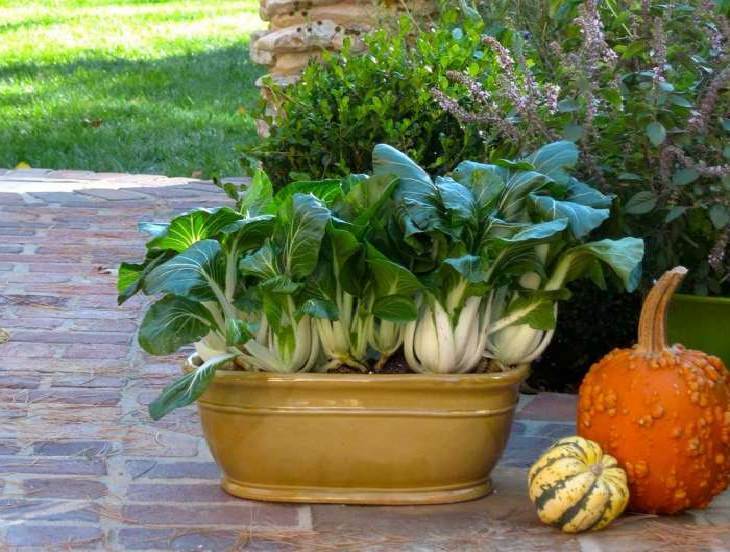 A planter that is just 6 inches deep is enough but if you want to grow larger varieties use 8-10 inches deep pot. Allow 3 inches of space between each plant. Asian greens are great crops to grow in pots as they grow fast and don’t need a lot of sunlight. You can grow them in part shade, in a spot that receives at least 4 hours of morning sun. Providing them plenty of moisture and organic fertilizer is important so that they thrive. Spinach is one of the best vegetables for containers. 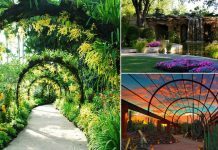 It grows well in partial shade and any kind of space. Growing spinach in containers is easy too, you can even grow it indoors on a windowsill. For growing spinach in pots, choose a container that is least 6-8 inches deep. You don’t need a very deep pot rather use a wide one. 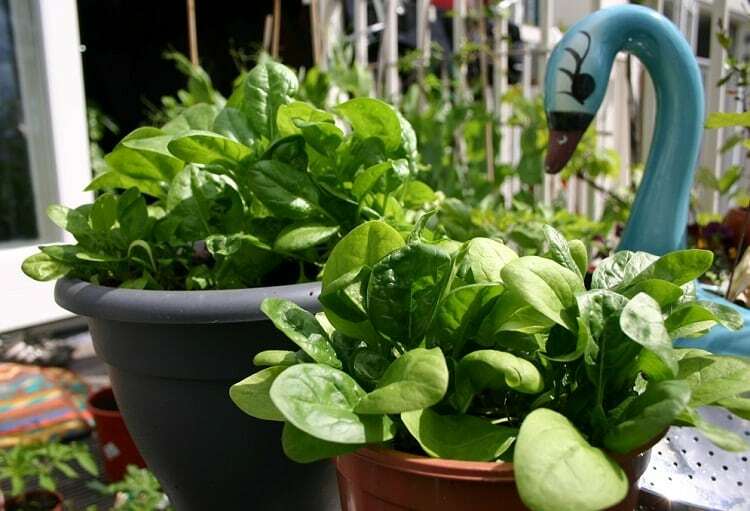 Learn how to grow spinach in pots here. 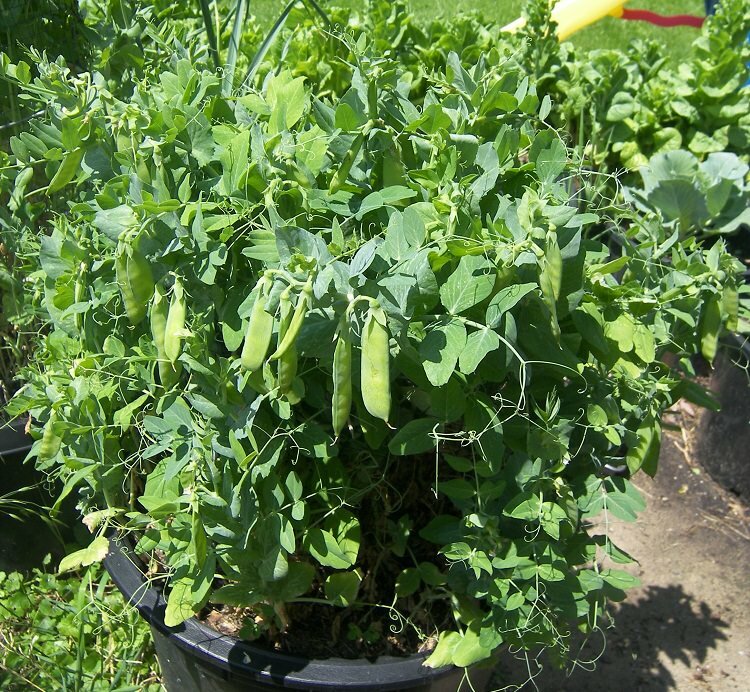 Peas prefer moderate conditions, they are a perfect crop for container gardening and don’t require a large pot. They grow quickly without attention. You can even grow peas on a balcony. Choose a dwarf or bushier type varieties and do regular and frequent watering as peas prefer slightly moist soil. Keep the plants in a spot that receives full sun. Carrots grow best in cool weather. They need regular watering and moist soil. Otherwise, the roots dry out and crack. 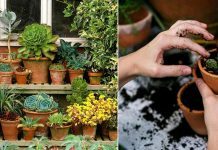 Growing this plant in containers is easy, and it doesn’t take much space as well. 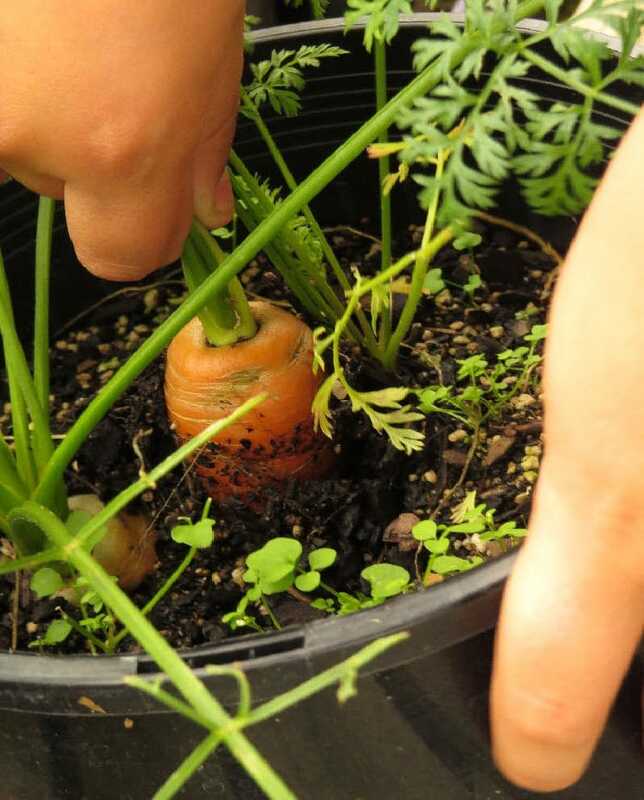 Learn everything about growing carrots in pots here. Cucumbers are heavy feeders and require regular watering too. Grow them in a medium to large sized pot (depending on the variety) and in full sun. You can have your homegrown successful crunchy cucumbers within a few months. To learn more about growing cucumbers read this article. Although eggplants are susceptible to many garden pests, still growing them is easy. They are heat-loving plants and need high temperatures both day and night, thus a suitable summer crop. But if you live in a warm climate, you can grow it year round. Also, it is easier to maintain them in containers than in a large vegetable garden. 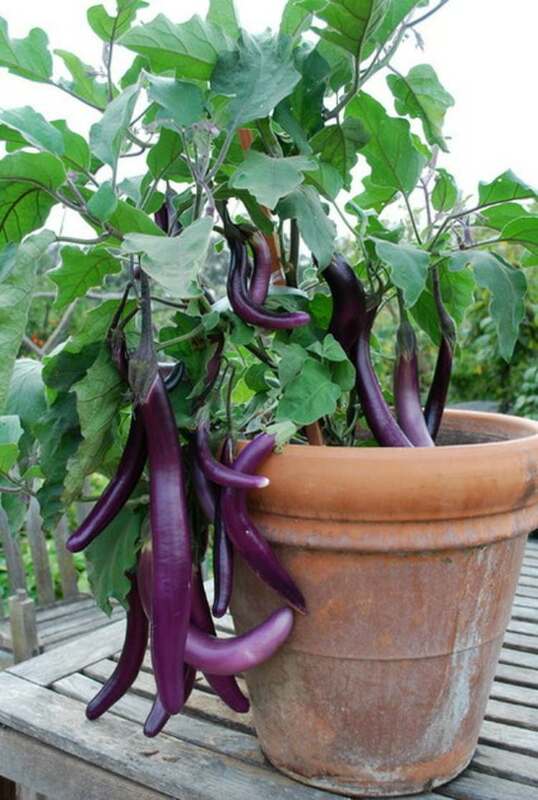 It is necessary that you keep the pots in full sun and feed heavily (like all other plants from tomato family–peppers, tomatoes, potatoes; eggplants are heavy feeders too). Squashes are easy to grow plants. Summer squashes (Zucchini) are more productive than winter squashes. You can harvest bountiful even in containers. 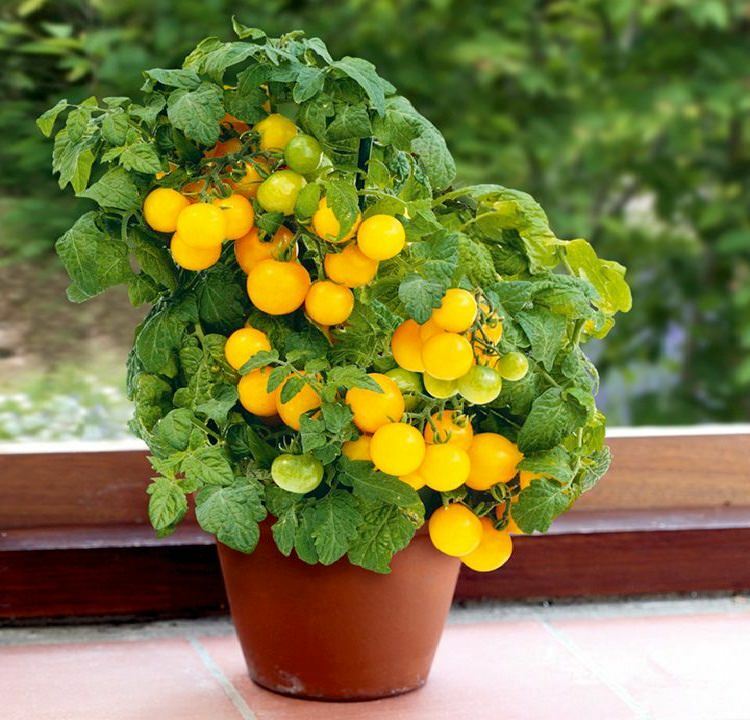 It is one of the most suitable crops for rooftop, balcony or patio gardeners. 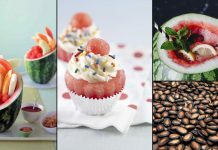 What kind of plant food do you use? Everything looks so lush and productive. Could you tell me a little about growing Chinese Lantern plants? Be cautious with Chinese lanterns! Pretty to look at, but very invasive!! I’ve been trying to kill them off for years! What a great article. My husband and I have a large spot for a garden on our new property but honestly I am a bit intimidated with such a large space and so little experience. Container gardening may be just the stepping stone i need this year. Thanks for sharing! I let my containers grow weeds last year due to surgery, but hopefully I can get back to it this year. This has inspired me, Thanks. Thank you for this information. I lo be my veggie garden but hate fighting the weeds! Using containers this year. You have to consider what types of plants you can grow in your area. Some of the above are for colder regions so you have to research first. As for where to find the seeds, you can do it online or ask the local vegetable vendors to know where you can get them in your area. You can buy seeds online, which would be delivered to your door stem there are many websites which provide such service.Search on google. Really nice post.. Thanks for sharing. This makes my garden beautiful. Very informative! i find the information very useful even though i leave here in a tropical paradise called the Phillipines. Awesome idea… I truly appreciate the ideas.. and will be trying them out. Beautiful garden. Please tell me the kind of fertilizer to be used. I use Miracle Grow in my watering can for container vegies. Works really well, make it a little weaker than the directions as you will be using it regularly. Try in also on African Violets…..they love it.